One of my most favourite roses, which I’ve just bought as a standard specimen, with large ruffled creamy white and intensely fragrant flowers – a floribunda of great style, poise and with superb health. And oh! did I mention the fragrance! Ask any rose enthusiast which rose has the best perfume, and invariably this rose is at the top of many lists. 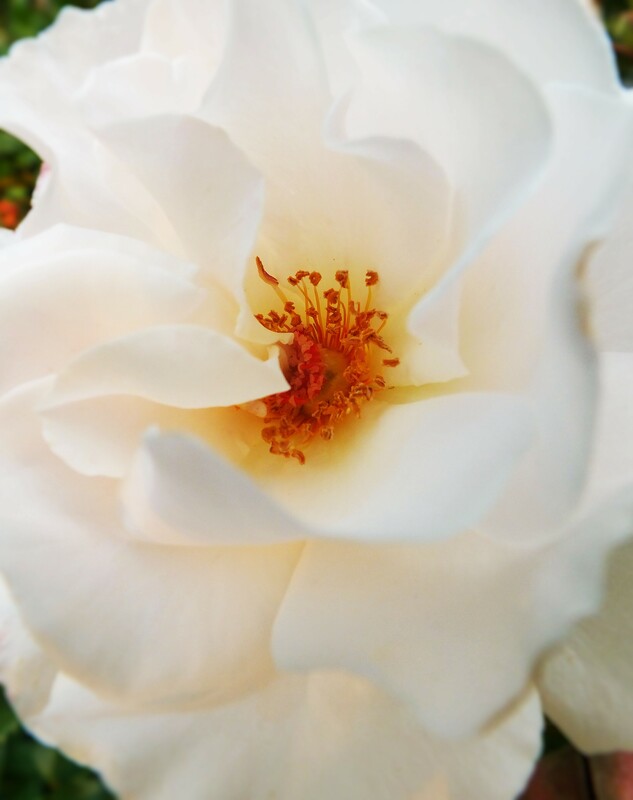 For over thirty years this beautiful rose has been grown all around the world, not only for it’s outstanding perfume but for it’s beauty, reliability and health. It has taken pride of place in millions of private gardens, and planted profusely in public and municipal gardens in practically every country where the climate allows. A truly remarkable rose which has won numerous awards around the globe which include. Royal National Rose Society Edland Fragrance Award 1978. It has often been called the perfect floribunda rose which is high praise indeed considering how many floribunda’s have been bred over the years. The blooms on ‘Margaret Merrill’ are quite large for a floribunda and often measure 4ins (10cms) across . The blooms begin as hybrid tea type buds and open very wide, singly, and in clusters. 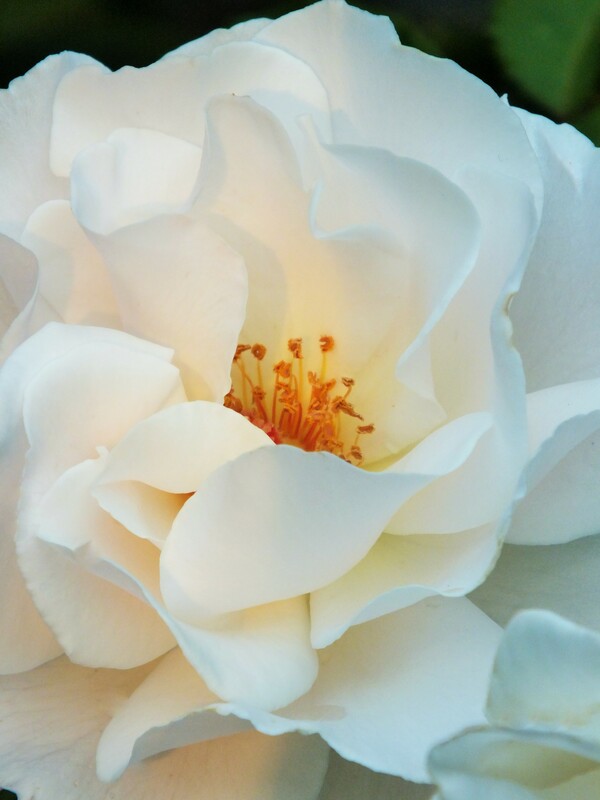 The almost transparent petals are white with a faint blush tint towards the centre, and have attractive golden stamens. The flower production is exceptionally prolific and the blooms are produced on short to medium length stems which are ideal for cutting.. The flowering period is quite remarkable as the blooms appear almost continually from early summer and well into the autumn. The abundant handsome foliage is big and glossy and the leaves are very close to the flower, giving a high shouldered effect that shows off the crisp flowers to perfection. The plant will tolerate a wild range of climates, but we have found that it does best in a cooler climate. We have always found it a very healthy and robust rose which is easy to maintain. Occasionally in wet weather it does tend to show a little black spot, but this can be easily kept under control with regular spraying and is not a big problem. The sublime quality of Margaret Merrill’s perfume is legendary. Even after forty years it’s as stimulating and exciting as ever. The perfume has been described as a mixture of citrus and spice. The perfect bedding rose which also makes an amazing scented hedge. Who was Margaret Merrill ? The rose was named after Margaret Merrill, which was the nom de plume for a fictitious Oil Of Ulay beauty advisor.